The purpose of restorative dentistry is to return health and function to the mouth while relieving any pain. Why then do some patients experience tooth sensitivity after dental fillings and crowns? At our Wilmington, DE cosmetic, restorative, and general dentistry practice, Smile Solutions by Emmi Dental Associates, we are careful to warn patients that they may experience some tooth sensitivity after having dental fillings or crowns placed; however, this sensitivity generally resolves itself within a week or two. There are cases in which this sensitivity does not subside and, in fact, increases over time or even evolves into pain. In these cases, it is necessary to contact the dentist and have the problem diagnosed. There may be a simple problem with the filling or crown, or further treatment of the tooth may be necessary. The good news is that, almost certainly, it will be possible to bring the discomfort to an end. What Causes Tooth Sensitivity after the Placement of a Filling? Tooth sensitivity after having a filling placed is extremely common. In fact, most patients will experience some degree of sensitivity to hot and cold temperatures and the pressure of biting after having their fillings placed. This sensitivity is temporary in most cases; the tooth simply needs time to heal after having undergone treatment for a cavity. Patients are advised to avoid those things that trigger sensitivity, including extremely hot and cold foods and drinks, hard and crunchy foods, and any other known triggers. If sensitivity does not subside within a couple of weeks of having the filling placed, then there may be a problem with the filling itself. If the filling contains any metal, then the patient may be experiencing an allergic reaction. It may also be a poorly crafted or poorly fitted filling. These are problems that patients of Smile Solutions by Emmi Dental Associates can expect not to have to face. 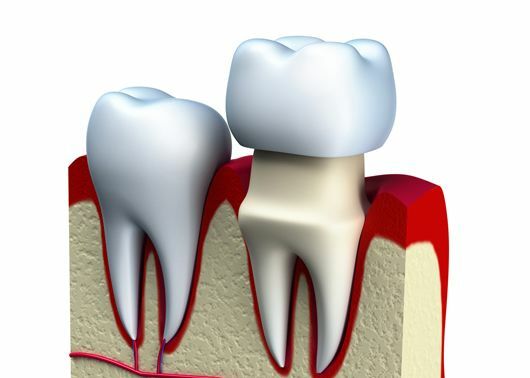 What Causes Tooth Sensitivity after the Placement of a Dental Crown? In some cases, tooth sensitivity after the placement of a crown is a matter of the crown being a little too tall and therefore receiving too much pressure when it comes into contact with the opposite-facing tooth when the patient bites down. This is a relatively simple problem to fix. However, in most cases, lingering tooth sensitivity after the placement of a crown – assuming that the crown wasn’t placed after root canal therapy – can be attributed to infected or otherwise damaged dental pulp. In such cases, root canal therapy will be necessary in order to relieve the tooth sensitivity. A new dental crown will be affixed to the tooth after the affected dental pulp has been removed and the root canal has been disinfected and replaced with a filler substance. After this procedure, the tooth sensitivity should be completely resolved. To learn more about tooth sensitivity after the placement of dental fillings and crowns, please contact Smile Solutions by Emmi Dental Associates today.